Nitrogen in the Environment, Volume 2: Soil-Plant-Nitrogen Relationships is the second of a two-volume treatise based on manuscripts presented at the international conference on ""Nitrogen in the Environment,"" held at the University of California Conference Center, Lake Arrowhead, in February, 1977. All original manuscripts were revised in accordance with discussions at the conference. The chapters published in these volumes are those revised manuscripts, with provisions in each chapter to preserve the major suggestions for their improvement. 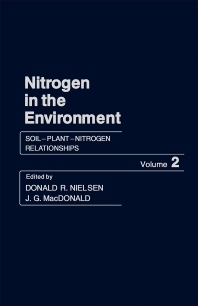 These two volumes—Nitrogen Behavior in Field Soil and Soil-Plant-Nitrogen Relationships—should be of value in bringing into perspective current knowledge on selected aspects of nitrogen in the environment. The book contains 22 chapters and opens with a study on the factors influencing nitrate acquisition by plants; assimilation and fate of reduced nitrogen. Separate chapters follow on topics such as absorption and utilization of ammonium nitrogen by plants; potential nitrate levels in edible plant parts; control of biological nitrogen fixation; and methods for analysis of denitrification in soils.